Proposed Budget Cuts for 52 Agencies Appear Small, but Are They? Gov. 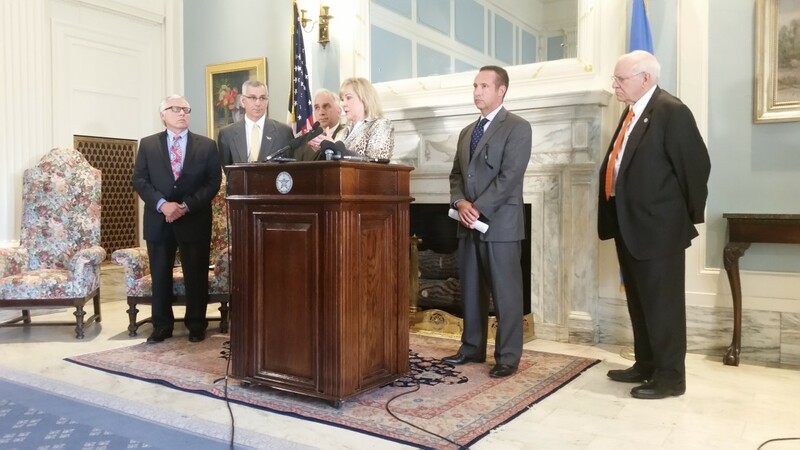 Mary Fallin, flanked by state officials, unveiled budget proposals Wednesday. Gov. Mary Fallin, flanked by state officials, unveiled budget proposals Wednesday. Photo by Clifton Adcock. In the confusing arithmetic of state budgets, the size of a cut or an increase can be in the eye of the beholder. That was the case on Wednesday when Gov. Mary Fallin unveiled a new budget proposal for fiscal year 2017 calling for a 4.5 percent cut in budgets for 52 state agencies, including higher education. But wait. That 4.5 percent is a share of those agencies’ expected spending totals after receiving cuts during the current fiscal year, totaling 7 percent of their annual budget. If the proposed 2017 cuts for those agencies were calculated as a percentage of their budget at the beginning of 2016, the cuts would appear deeper: about 11.5 percent. Also, the funding for 2017 proposed by Fallin for 11 agencies – including 4.6 percent listed in her handout for the Education Department, 6.8 percent for the Health Care Authority, 8.7 percent for the Department of Human Services, 6 percent for the Corrections Department and 7.2 percent for the Mental Health Department – would appear smaller. The governor did say that these agencies would see their funding restored in 2017 to the 2016 budgeted amounts, so their budgets would remain flat. But she did not express the 2017 cuts to the 52 agencies as a percentage of their 2016 budgets. The lower number for the cuts shown in the proposal, 4.5 percent, are presented to be “more honest and accurate”, said John Estus, public information officer for the Office of Management and Enterprise Services. However, for some agencies proposed to receive increases in 2017 – the Education and Corrections Departments – the percentages did not factor in supplemental appropriations approved during this fiscal year. Doing so would make their proposed 2017 increases look smaller. The state’s budget gap is expected to widen to $1.3 billion in the upcoming fiscal year, beginning July 1. This fiscal year, decreased revenue put the state $900 million short of projected revenue. In January, state agencies were forced to implement a 3 percent cut to their annual budget. An additional cut of 4 percentage points was implemented in March, requiring state agencies to cut a total of 7 percent from their annual budget with four months left in the fiscal year. According to Fallin’s office and the Office of Management and Enterprise Services, Fallin’s proposal would increase the amount of money available for state appropriations by 3.5 percent, or $233 million, compared to the state’s budget following this year’s 7 percent mid-year cuts. However, the proposal comes in at a 2.1 percent less than the amount budgeted by the Legislature at the beginning of the current fiscal year. The additional money for appropriations under the proposal would come from a host of changes to the state’s revenue systems, including scaling back on, or in some cases eliminating, money divvied up between state and some local entities, eliminating tax exemptions, capping certain highway funds, issuing highway bonds, eliminating the personal income tax double deduction, and making the earned income tax credit non-refundable. If the entire proposal is adopted as is, after appropriations and other state expenditures, the state’s budget would have about $84 million left over, according to the plan presented Wednesday. This year’s 7 percent mid-year budget cut to all state agencies are also hitting those agencies harder than they otherwise would if the cuts had come earlier in the year. The 7 percent cut that came in March is an annualized cut, meaning the cut comes out of what state agencies were budgeted to be getting for the entire year. Those agencies don’t get the lump sum of their budgets at the beginning of the year however. So the first round of 3 percent cuts that began in January and the 7 percent cuts that began in March have to make up for the months when those agencies were getting 100 percent of their monthly funding. Since only 6 months were left in the year when the 3 percent cut came down, and only 4 months were left in the fiscal year when the 7 percent cut came down, that means that for each month left in the fiscal year, those agencies are actually getting an 18 percent reduction in their monthly funds, Estus said.